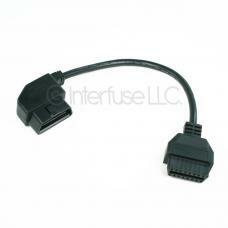 A right angle OBD-II Extension Cable that measures 12 inches long. On one end (the male) the adapter is at a right angle, the other end (female) is normal. This can be used to plug into an OBD-II compliant vehicle and coupled with OBD-II diagnostic hardware.